One of the most famous mastering engineers has written the definitive work on mastering, and in the process has created an indispensable resource for anyone working with audio. There is now a huge number of published books covering all aspects of audio engineering and music production. They all offer something useful to the intended audience, but there is a select subset of books which are must-haves — books which manage to provide real-world practical advice backed up by easily understandable and relevant theory. A short list of such books will inevitably vary to a degree, depending on the particular interest of the reader, but of around 90 audio and music-related books filling my office shelves, I find there are a select few I refer to on a regular basis. 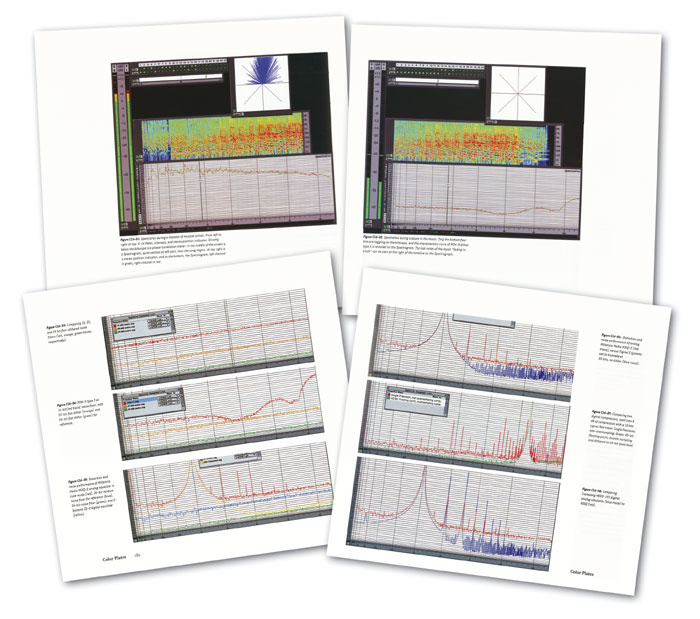 Audio Metering (published by DK Audio) is one, Watkinson's The Art Of Digital Audio is another, and Streicher and Everest's The New Stereo Handbook is a third. However, the latest addition to my audio library is also one which I feel will join this select group. 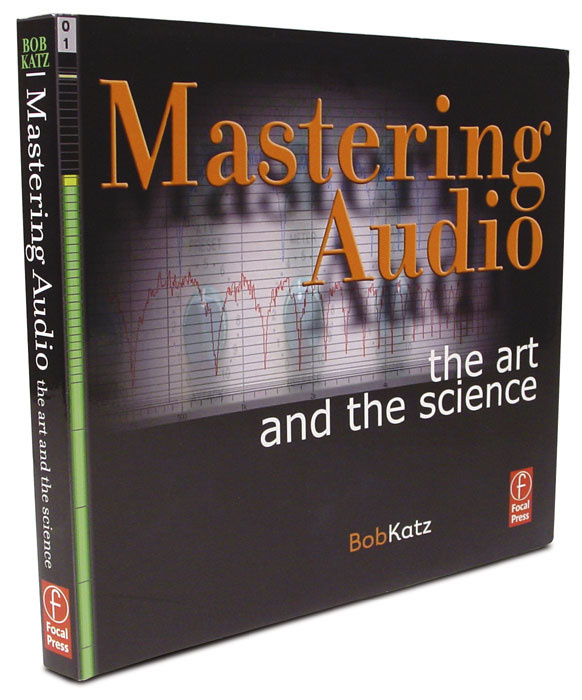 At over 300 pages, Mastering Audio — The Art And The Science is written by Bob Katz and published by Focal Press. The author is probably already familiar to most people reading this, but for those who haven't come across the name before, he is one of the best-known and most highly regarded mastering engineers in the USA. He also appears to be very well connected, as there are numerous short contributions in the book from many fellow mastering engineers and producers. The topic of mastering is a hugely diverse and surprisingly complicated one, involving — as the book's subtitle suggests — both art and science, in roughly equal proportions. But whereas it is relatively easy to define, explain and document the scientific and procedural aspects of mastering, trying to get across a meaningful impression of the art and aesthetics involved in music mastering is a much harder challenge. I'm pleased to report that Bob Katz has managed to progress much, much further in the latter than the authors of any previous book on mastering that I have read — and I've waded through a fair stack in my time. While many books ostensibly about music mastering discuss the technology involved, Katz talks primarily about how to use the technology, with practical advice and examples in many cases, and all with such down-to-earth common sense and logical argument that even complex issues seem obvious. Best of all, Katz is clearly a man who likes the sound of music — pretty much any music — for its own sake, and is a vehement defender of real musical dynamics. A good impression of the level of detail to be found in this book is presented on the very first flyleaf of the book. A fold-out reproduction is provided of a hand-drawn chart made by EJ Quinby at Carnegie Hall in 1941, showing the relation between musical pitch and notation, frequency, and the ranges of all the instruments of the orchestra, singing voices, piano and organ. It is a work of art in its own right, but the information it conveys actually underpins much of what this book is all about. Perusing the Contents page reveals just how in-depth this book is. The 22 chapters are divided into four sections, with a further 13 appendices and a pretty comprehensive index. 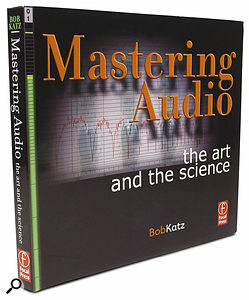 The first three sections comprise Preparation, Mastering Techniques, and Advanced Theory & Practice, while the fourth covers some of Bob Katz's fascinating personal conclusions about both the process and the industry of mastering. 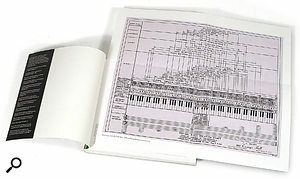 Just inside the front cover is a splendid hand-drawn chart from 1941, showing the relation between musical pitch, notation, frequency, and the instrument ranges.Chapter one starts the ball rolling with descriptions of the various steps involved in producing a record album, the philosophy of mastering, the work flow and the basic procedures. Even in this first chapter, the detail flows thick and fast, with discussions about logging information pertinent to the mastering process, picking the right workstation, media verification, backups and archiving, and quality control. The following chapter investigates the kinds of equipment necessary in a professional mastering studio, and how best to connect this equipment together. This inevitably includes discussions about the rudiments of clocking and some of the important issues involved in selecting A-D and D-A converters. With the basic concepts and philosophies of mastering behind us, chapter three moves on to the most important element of all, the ear — or more accurately, how to train and use it. There is a lovely diagram included here which shows the frequency regions in which boosts or cuts in amplitude produce the subjective impression associated with terms like muddy, sweet, fat, edgy and so on. Katz also sets seven specific ear-training exercises in this chapter — all superficially trivial and easy to do given a little effort, yet these are crucially fundamental skills for anyone interested in improving their hearing acuity in the context of recording or mastering music. The next chapter takes us back into the classroom with some theory and practical advice about word lengths and dither. Katz's explanations of the requirement for dither in any digital system and how dithering works are simple to understand, but technically accurate. There is also lots of practical information about the subtleties of some of the more common commercial dithering algorithms, as well as the correct way to manage word lengths in digital systems. It seems amazing, but it's not until you've read five chapters into the book that you stumble into the often confusing (or is it just confused?) world of decibels, and how they relate to the various metering systems in common use. 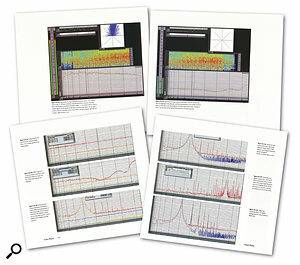 The complex issues of digital Overs, oversampling meters, sensible recording headroom, and safe peak mastering levels. 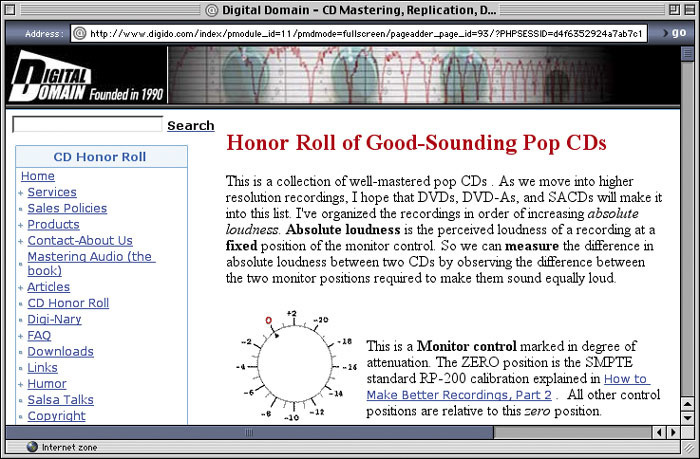 At this point Katz hints at one of the fundamental mastering concerns — loudness. This is clearly a subjective term, but one which can be made almost objective according to Katz by adopting carefully calibrated monitoring levels. So there follows an involved discussion on gain staging, optimised signal levels, and the typical peak levels and dynamic ranges associated with different applications: recording, broadcast and mastering. Chapter six investigates the requirements of monitoring in the mastering suite in far more detail, covering topics such as subwoofers and bass response, monitor equalisation, and some very entertaining (but sadly all too true) myths about what a good monitor system should be. This is the concluding chapter of the first section of the book, so with a good understanding of the basic concepts, technologies and philosophies, we are ready to start learning about the science and art of the mastering techniques. If you'd like to get a taste of Bob's ideas before you get hold of the book, surf over to his Digital Domain web site, because there's an extensive archive of technical articles about audio, and mastering in particular, which are free to view. In addition there's a fascinating CD Honour Roll, providing a set of great references when you're recording and mixing your own material. If you're after the Bob Katz treatment for your own material, then you can get details about the mastering, graphic design and CD manufacturing services his company offers from here as well. Then there's also a Products link, which includes information about Bob's mysterious proprietary K-Stereo processor. Katz's masterclass begins in chapter seven, with a look at the art of sequencing tracks together to make an album — choosing the right track to end the album, how to deal with a track which is stylistically different from the rest, and how to determine the gaps between the tracks. After this is a discussion about track start IDs, PQ coding (as well as the Red Book requirements), stand-alone CD-burners and hidden tracks. The chapter continues on the subject of editing: topping and tailing tracks and removing unwanted noises before and after the track, adding fades and tails, editing material together, and so on. The final section deals with the basic levelling of tracks. A section of colour plates towards the middle of the book illustrate some of the technical points raised in the text.Chapter eight launches into the 'dark art' of equalisation and the whole question of what constitutes a good tonal balance. There is also technical information about different kinds of equalisers, the functions of their controls, and the strengths and weaknesses of each of these devices in the context of mastering. Katz then talks about making A/B comparisons between settings, and the problems associated with equalisation boosts, before closing the chapter with a look at some specialised EQs such as linear-phase and dynamic models. The obvious next step from EQ is dynamic control, and this is the subject of chapter nine. Katz divides the subject into two: macrodynamics — the loudness differences between different sections of a song — and microdynamics — the rhythmical dynamic changes throughout a song. He goes on to explain the four different categories of dynamic processing before describing the benefits of manual dynamic control and the techniques involved. The next two chapters discuss automatic dynamic control in great detail, starting with the downward processors — compression and limiting. Single and multi-band devices are considered, along with the effects and uses of each of the generic controls, and some sage advice about how to avoid making 'hypercompressed' recordings. Some rather less common dynamics processing techniques are the subject of the next chapter, with upward (or parallel) compression and the even more rare upwards expansion techniques (found in the Dbx Quantum processor and the Waves C4 plug-in, for example). To close the chapter, Katz brings us back to our starting point by describing ways to change microdynamics manually. Chapter 12 examines noise reduction techniques, both with dedicated processors such as the CEDAR tools, and with more generic solutions such as single-ended filtering and narrow-band expansion. The following chapter continues the rare but useful processing techniques theme with a review of alternative techniques such as M&S equalisation and compression, as well as how to deal with phase shifts, azimuth errors and DC offsets. However, it starts off with a discussion on monitoring fundamentals such as inter-channel balance and relative/absolute polarity. There is also a section on 'remixing' at the mastering session and the importance of the order in which signal processing devices are chained together. For many readers, one of the most relevant parts of this chapter will be the commentary describing a wide range of 'mastering processors' including high-end equalisers and dynamics devices, 'ambience recovery' units, reverberation processors, de-essers, and so on. At this point in the proceedings Katz brings us back to the topic of a calibrated monitoring system — something he feels is an essential element in 21st-century mastering installations in order to bring some objectivity back into the perception of loudness. He goes on to discuss the correct mechanical and electrical alignment of stereo and surround monitoring systems, subwoofers and bass management. Chapter 15 continues with a review of the traditional metering systems and their inadequacies in a digital environment, before introducing his own K-System of metering — a logical and thoughtful metering system which, if widely adopted, may well help to end the ridiculous 'loudness wars' in which we are currently embroiled. Most mastering rooms employ analogue processors, and chapter 16 looks at the issues surrounding the use of analogue and digital processing, as well as discussing the issues involved with converting between the two domains. It also considers various aspects of digital signal processing, single and double precision, floating-point arithmetic, oversampling, dithering, and so on. The next chapter, intriguingly entitled How To Achieve Depth And Dimension In Recording, Mixing And Mastering, is required reading for a great many engineers, I think! Katz talks here about mono and stereo masking, the Haas effect and its implications, the importance of microphone techniques and placement, recording environment acoustics, and the deleterious effect that poor-quality digital processing can have on the preservation of depth in a recording. Chapter 18 discusses high sample rate formats, starting with the concept of oversampling, and then moves on to the issue of up-sampling before investigating the benefits of higher sample rate PCM and DSD systems in general. The next chapter continues the myths and mysteries theme with a look at jitter — what it is, where it comes from, and how it can (and can't) affect digital audio. There is a great deal of fascinating technical information here, but it is all related directly to the real-world practicalities of recording, manipulating and monitoring digital audio. The subject matter naturally leads into discussions of 'de-jitter' and reclocking systems, and central word-clock generators. Tips And Tricks is the helpful title of chapter 20, which provides practical information on dealing with timecode and video synchronisation in a digital system, the complex issue of frame-rate pull-ups and pull-downs in video-related work, word-clock voltages, working with AES-EBU and S/PDIF interfaces, impedance issues, cable lengths, optical cables, status bit flag problems, and high sample rate interfaces. The chapter continues with information on such diverse topics as CD text, unbalanced versus balanced analogue interfaces, analogue tape simulation processors, ISRC codes, the PMCD format, and writable DVD confusion. 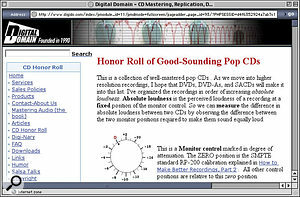 There is also some useful information about mastering for vinyl and cassette media, as well as hard disk formatting and digital versus analogue monitor level controls. Throughout the book there are dividing pages between the various sections and chapters which carry pertinent and often amusing quotes. There is one from Katz himself that reads, 'It's not how loud you make it. It's how you make it loud', and another I particularly enjoyed from Frank Zappa which is a great twist on an all too familiar assertion, 'We'll fix it in the shrink-wrap'. And so we arrive at the last section of this book, which starts off emphasising the need for education on the importance of dynamic range — not only for the recording and mastering engineers, but also for producers, equipment manufacturers and the record-buying public. and art comes from long-worked technique. Well, okay, at least Katz has the day job to rely on! The remaining 30-odd pages of the book pick up the original theme again, starting in the first appendix with a fascinating and very thorough treatise on typical broadcast processing techniques — the dreaded Orban Optimod and its peers — with some constructive advice on how to optimise the mastering of material intended for radio play. The next appendix describes the multitude of audio file formats, and this is followed by a section on how to prepare tapes and files for mastering — media, levels, labels, tones, handles, sample rates, file names, and split multi-channel files. All useful, practical stuff. There are even some sample labels and documentation examples to get you started on the right path. The next four appendices provide raw technical information. The first concerns relative signal levels with differing analogue tape fluxivity standards and a table relating dBu to RMS voltages. There is then a handy Q value to bandwidth (in octaves) converter for anyone whose equaliser of choice uses whichever is the unfamiliar term, and the last two sections cover maximum data transfer rates for different digital media and typical data capacities, costs, and the number of track hours that can be supported. Appendix nine provides a lot of technical information on the K-System of metering and monitoring, and this is followed by a list of recommended reading and listening and a comprehensive glossary of technical terminology. If I had to make any criticism at all of Mastering Audio (bar the poem! ), I would have to say that grouping all the colour pictures in the centre of the book makes them a little cumbersome to reference with relation to the text. However, to be honest, there is nothing that takes away from the fact that this is a truly excellent book. Katz is comprehensive in his coverage of the subject, detailed and unambiguous in his explanations of the technicalities, and clear-headed and logical in his philosophy and approach to mastering. There is a huge amount of 'meat' in this book and plenty of practical guidance for both the novice and more experienced amateur alike. If you are interested in the process of mastering — whether for background information as you watch a professional work his magic over your recordings, or because you want to improve your own abilities — you simply must read this. Detailed information in every topic area. Sensible, clear-headed philosophy to mastering. Katz's laudable campaign for increased music dynamics. Useful suggestions for further reading and listening. The colour pictures are grouped in the centre of the book, which makes them a little awkward to refer to while reading. A comprehensive and unusually practical book which deals with exactly what it says on the cover. If you only buy one book on audio, this has to be it — it should be required reading for anyone involved with recording, producing or mastering music. Focal Press +44 (0)1865 310366.